Chef LaLa has graciously shared this recipe with LatinoFoodie for stuffed poblanos in a walnut sauce as part of our call out for pork dishes. While the ingredient list may look daunting, most of the ingredients are probably already in your kitchen. 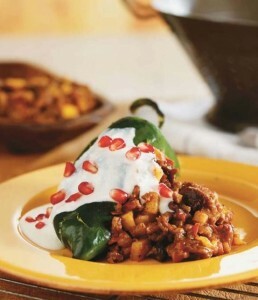 So for dinner this week indulge in these Chiles en Nogada from our friend Chef LaLa. Not only is she an amazing cook and certified nutrtitionist, but she has devoted her time and energy to important causes like diabetes awareness and prevention, Michelle Obama’s Let’s Move campaign and others. Chef Lala runs her own high-end catering business, SAVOR!, in Los Angeles. She regularly doles out her savvy solutions for better living at conferences worldwide and on international and national television, including NBC’s Today show, Martha Stewart, Dr. Oz, Univision and CNN en Español. If you like this recipe, follow her on Facebook or Twitter and let her know. 1. To make the filling heat skillet over medium-high heat. Add salt pork and brown. Add garlic, cook 1-2 minutes. Add beef, pork and veal. Cook, stirring occasionally to break up and separate meat. Stir in apricots, peaches, apples, plantain, raisins, prunes, and tomatoes. Lower heat and cook 20 minutes. Add cloves, nutmeg, cinnamon, thyme, bay leaves, black pepper, white wine, sherry, and salt. Simmer 1 hour. 2. Place chiles over high flame and sear until black but still firm. Place the chiles in a plastic bag for 10 minutes; peel. Make a slit on one side about three-fourths the length of the chile. Remove seeds and veins. Place on paper towels; wipe dry. Stuff with filling and refrigerate until ready to serve. 3. Boil walnuts 5-8 minutes then remove shells. Place walnuts, almonds, goat cheese, queso cotija, white bread, half-and-half, sugar, cinnamon, sherry, and salt in a blender or food processor. Puree until smooth. Refrigerate until ready to serve. 4. Place cold chiles on plate topped with walnut sauce. Garnish with pomegranate seeds. Tip from Chef LaLa: Chiles should be fresh, firm, and shiny. Avoid using dull, soft or wrinkled chiles; they’re old and will be too soft after they have been seared and skinned. If chiles are fresh they will be easy to handle when stuffing and cooking.